So what I really want is a wood burning oven in my back yard, or better yet on my back deck, so that I can make even better pizza than I already do, which is pretty good if I do say so. In addition, of course, I could make wicked bread and roast stuff and cook salmon in about a minute and a half and ............ but I digress. Barring a lottery win, and since I rarely buy tickets my chances aren't good, I'm not going to get the wood burning oven of my dreams anytime soon so I decided to experiment with pizza on the grill. 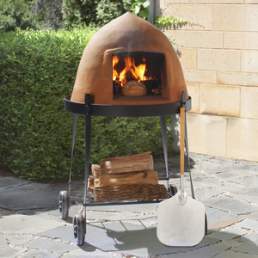 There's tons of info out there about grilling pizza and lots of zealots who claim it's the only way to make pizza, assuming of course you don't have one of those post lottery win wood burning ovens lying around. The problem is that as with many things regarding food, and the internet, much of the information is contradictory, direct heat, no, indirect heat, straight on the grill, no, on a veggie tray or a pizza stone, lid up, lid down ..........it's enough to make you give up on the whole idea, but I forged ahead because I really would like to make pizza in the summer without over heating the kitchen, assuming it ever gets hot enough for that to be an issue of course . So last night I made my initial attempt at grilling pizza and while it wasn't a resounding success both daughter and I agreed that it showed enough potential to try again, wife is in Los Angeles at a conference so she made no comment. I made what I think were two mistakes: first I used thawed home made dough which seemed to lack in yeast as it rose very little over the course of the day and resulted in a slightly tough crust but my second mistake was not letting my fire get hot enough before putting the dough on the grill. This is a problem I have often with the grill, I lack patience and start too early which is why wife generally handles the grill, regardless the pie turned out alright with a nicely charred crust and I was able to get the topping hot and the cheese melted, apparently these are problems that frequently occur in grilling pizza. I had the foresight to have a backup pizza ready that was baked in the non wood burning oven and it was definitely slightly better cooked than the grilled pizza, but the grilled pizza had nice smoky flavour and that great charred crust so I'm going to persevere. 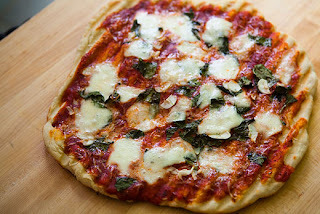 Next time I'll use freshly made dough and let the fire get hotter and see where that leads me, I'll probably still do a backup oven pizza though, I mean what's the worst case scenario: Too much pizza ? Not a problem in our house. I was so focused on the pizza that I forgot to try out a new Pizza Red, settling instead for La Casona de Castano, a reliable consistent Monastrell from Spain which is in steady rotation as our House wine but which really lacks the acidity required for pizza. Anyway I'll keep you posted on Pizza on the Grill and when I finally master it I'll let you know what technique worked for me.